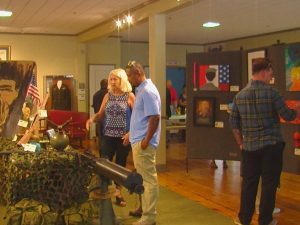 WILMINGTON, NC (WWAY) — The 2016 Wounded Warrior Art Exhibition is on display in downtown Wilmington. The exhibit features art by wounded warriors from Camp Lejeune. Most of the art on display is available via silent auction through August 21, with proceeds being shared between the artists and the Museum of the Marine. The exhibit will be open to the public from August 5 – 21 at the Hannah Block Historic USO & Community Arts Center.